By the time 1982 rolled around the Agora was pretty much on its last legs as a major act venue in the city. Early MTV hit-makers and other up and coming rockers of the day didn’t really get many booking slots as promoters relied on regional talent to fill bills that used to be reserved for national acts in the preceding years. 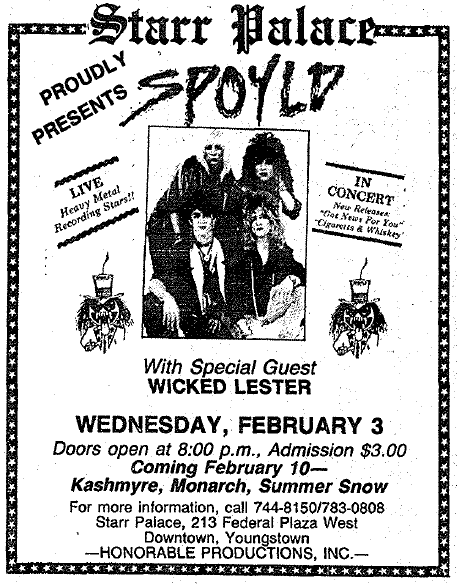 Area heavy metal fans did get a treat though when Britain’s Girlschool showed up for a gig on April 18, 1982 at the Agora. While the Youngstown area did not attract such well-known New Wave of British Heavy Metal acts Iron Maiden or Motorhead, Girlschool was the genuine article and was well-respected in metal circles around the world. In 1982, the band was testing the waters in the states for the first time with the album Demolition which included tracks from the band’s first two UK albums. WHAT THE SHOW SOUNDED LIKE: Here’s the band performing “Hit and Run” in 1982. 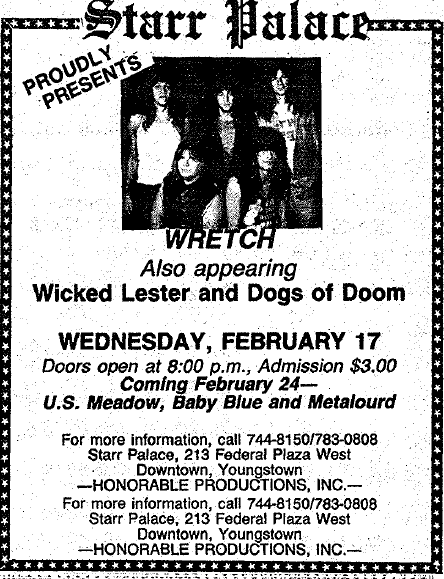 The Starr Palace (formerly Youngstown Agora, Tomorrow Club) made one last stab at relevance in 1988 and it involved booking regional heavy metal acts. 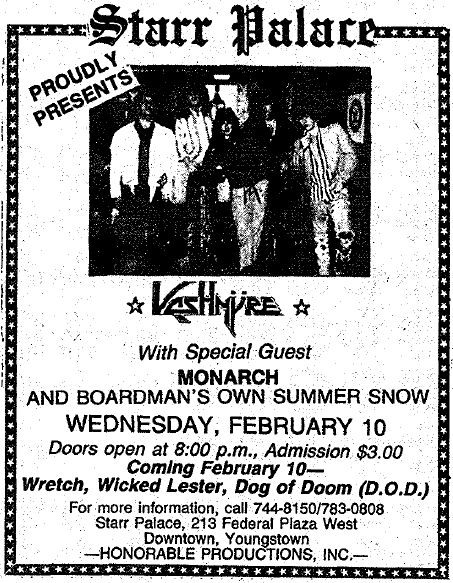 I found a few ads in The Jambar from early 1988 showcasing these rather cheap ticket shows. By early March the ads were gone from the YSU newspaper. Wretch are a well-known Cleveland metal act who is still active today. Some of Spoyld’s members went on to form Warrant. Judas Priest might have been a veteran band by the late ’70s, but they were also becoming a key component of the New Wave of British Heavy Metal. The band spent basically all of 1979 touring the world over in support of the Hell Bent For Leather album. When Priest reached Youngstown for a gig on September 9, 1979 at the Agora, the band was in its third leg of an American tour that year. By this time, Rob Halford and company were playing some arena gigs opening for Dynasty-era Kiss. The Youngstown show was a side gig on the arena section of the tour. It would take another year before Priest broke through on the album charts with British Steel. They would essentially be arena headliners for the next decade in the USA. Included on the bill were area hard rock legends Poobah. WHAT THE SHOW SOUNDED LIKE: Here’s a clip of “Take on the World” from a BBC broadcast during 1979.